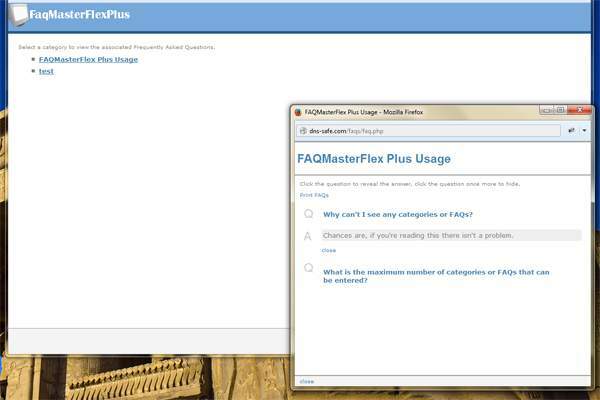 FaqMasterFlexPlus is database-driven web-based application for creating and maintaining Frequently Asked Questions (FAQs) and now it does it better. Customizable Header and Footer to allow matching the design of your website. Downloads available in our download section under the PHP Section. Changed code to use Form Post submit to avoid the max string length for a URL Address. Added config setting to display Faqs in Pop-up or New Page. Create a MySQL table, preferably faqmaster, then copy and paste SQL from faqmasterflexplus.sql info with your favorite GUI SQL tool (phpMyAdmin). To Create a new language file - name it "language name".php example ( for spanish - spanish.php ) - you must also change the $lang= to $lang="spanish" Edit the new Spanish file making proper tranlations for each line within the Quotes only! Upload contents of FaqMasterFlexPlus to your web server. Now change the admin password! from your Admin Screen! Otherwise, that's it! Then just copy all files to your original installation. If this your version 1.6 or older then Run the SQL upgrade script in your favorite GUI SQL tool. Enter the proper information in the new "faq_config.php" file. Run the sql script faqmasterflexplus_upgrade.sql which will reset the user back to the default with the default password. Faq Answers displays wrong answer. Added Install screen to simplify the install process. Ability to change language and ability to change Faq display style. 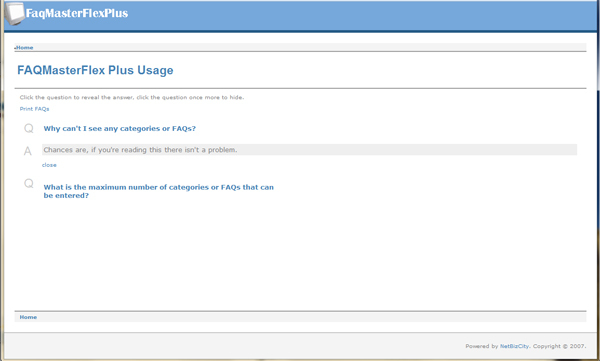 Added feature to allow faqs to display in same window or in a pop-up. Fixed non-secure login - moved login user info to Database. For any support issues use our contact page.